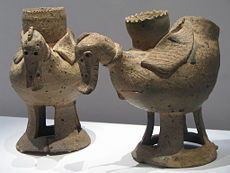 Duck-shaped pottery from Gaya, fifth or sixth century. Gaya refers to a confederacy of chiefdoms in the Nakdong River valley of south eastern Korea that coalesced out a shifting mosaic of group alliances and lasted roughly from 300 until it began to fragment in the first decades of the sixth century. The Gaya confederacy grew out of the Byeonhan confederacy, one of three han groups existing during the Samhan (three hans) period, and Gaya was ultimately absorbed into Silla, one of the Three Kingdoms of Korea that together occupied most of the Korean peninsula and extended north into parts of present-day Manchuria. The Gaya confederacy became a key component of the Silla dynasty. At the time Silla absorbed the Gaya confereacy, Silla was one of the three powerful kingdoms on the Korean Peninsula and Manchuria. Later in 660 C.E. Silla unified the Korean Peninsula, with the exception of Balhae in the north (including parts of today's North Korea, northeast China (Manchuria), and an extreme south east part of Russia). When Balhae fell to the Khitan people, that ended the great northern kingdom's influence on Korea. Unified Silla passed on its traditions and culture to the succeeding Goryeo dynasty and to Goryeo's successor, the Joseon dynasty. Although most commonly referred to as Gaya (가야; 加耶, 伽耶, 伽倻), due to the imprecision of transcribing Korean words into hanja (Chinese characters), historical sources use a variety of names, including Kaya, Garak (가락; 駕洛, 迦落), Gara (가라; 加羅, 伽羅, 迦羅, 柯羅), Garyang (가량;加良), and Guya (구야; 狗耶). 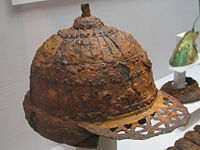 Iron helmet illustrating the skill of iron-working and importance of iron from the Nakdong River valley. According to a legend recorded in the Samguk Yusa (a collection of folktales, legends, and biographies from early Korean history), in the year 42 C.E., six eggs descended from the heaven with messages that they would be kings, and from the six eggs came six boys. Within twelve days the boys grew to maturity. One of them, named Suro, became the king of Geumgwan Gaya, and the other five founded the other five Gayas, namely, Daegaya, Seongsan Gaya, Ara Gaya, Goryeong Gaya, and Sogaya. Gaya arose from the 12 tribes of the ancient Byeonhan, one of the Samhan confederacies. The loosely organized chiefdoms resolved into six Gaya groups, centered around Geumgwan Gaya. On the basis of archaeological sources as well as limited written records, scholars such as Cheol (2000) have identified the late third century C.E. as a period of transition from Byeonhan to Gaya, with increasing military activity and changing funerary customs. Cheol (2000) further argues an association with the replacement of the previous elite in some principalities (including Daegaya) by elements from Buyeo, who brought a more militaristic style of rule. Situated around the mouth of the Nakdong River, an area with fertile plains, access to the sea, and rich iron deposits, Gaya had an economy based on agriculture and fishing, as well as trade. 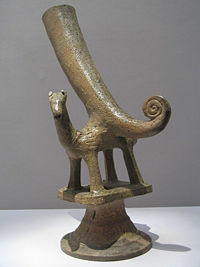 Gaya earned a reputation, particularly, for its iron working, as Byeonhan had been before it. Gaya exported abundant quantities of iron armor and weaponry to the kingdom of Baekje to the west and the Kingdom of Wa in Yamato Period Japan. In contrast to the largely commercial and non-political ties of the Byeonhan, Gaya seems to have attempted to maintain strong political ties with those kingdoms as well. Different records list different chiefdoms of Gaya. Goryeo Saryak (고려사략; 高麗史略) lists five: Geumgwan Gaya, Goryeong Gaya, Bihwa Gaya, Ara Gaya, and Seongsan Gaya. The various Gaya mini-states formed a confederacy in the second and third centuries C.E., centered around Geumgwan Gaya in modern Gimhae. 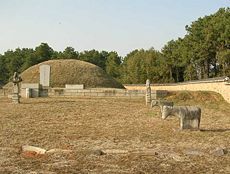 Archaeologists estimate that Ong Gwang Gobuon had been built in the second century, near Naju, Muan, Hampyeong, and Yeon-an. After a period of decline, the confederacy revived around the turn of the fifth and sixth centuries, centered around Daegaya in modern Goryeong County. Unable to defend itself for long against Silla and Baekje, the Gaya confederacy fell. Daegaya fell last, conquered by Silla in 562. Gaya had close relations with the Wa of northern Kyushu in Japan, during that nation's formative years. The nature of the relationship between the Wa and Gaya has been a matter of extensive controversy, mostly fueled by Japanese revisionist historians. The Nihonshoki claims Gaya (named "Mimana" or "Kara" in Japanese) existed as a colony or tributary of Wa. In World War II, the Japanese used that supposed historic link between Kyushu and Gaya as justification for colonization. Some Korean scholars believe that Wa may have been a colony or tributary of Baekje. Archaeological evidence portrays Gaya as the main exporter of technology and culture to Kyushu at that time. Today, most scholars, regardless of nationality, believe that Gaya and Wa maintained a close relationship, but not a colonial one. The argument that "Japan conquered the southern tip of the peninsula, where it established a 'colony' called Mimana, have since been largely discounted by historians in both Japan and Korea." The Gaya states each have a distinct history. Unfortunately, academic scholarship on one of them, Sogaya, is insufficient to reveal a picture of its culture and life. Geumgwan Gaya (Keumgwan Kaya)(43 - 532), or "Crown Gaya," also known as Bon-Gaya (Pon-Kaya, 본가야, 本伽倻, "origin Gaya") or Garakguk (가락국, "Garak State"), was the ruling city-state of the Gaya confederacy during the Three Kingdoms Period in Korea. Believed to be located in the modern-day city of Kimhae, Southern Gyeongsang province, near the mouth of the Nakdong River. Due to its geographic location, that kingdom played a dominant role in the regional affairs from the Byeonhan period onward to the Gaya confederacy. According to Samguk Yusa, Geumgwan Gaya consisted of nine villages united by King Suro of Gaya. Some legends present his wife, Heo Hwang-ok, as a princess from the Ayodhya region in India, although many believe that story to be a myth created from an embellishment during later Buddhist times. Several waves of migration from the north, including the earlier Go-Joseon, Buyeo, and the later Goguryeo, overtook and integrated with existing populations, stimulating cultural and political developments. A sharp break in burial styles has been noted around the late third century. Burial forms associated with North Asian nomadic peoples, such as the burial of horses with the dead, suddenly replace earlier forms in the tombs of the elite (Cheol 2000). In addition, earlier burials had been systematically destroyed. In the early 1990s, a royal tomb complex unearthed in Daeseong-dong, Kimhae, has been attributed to Keumgwan Gaya, although apparently used since Byeonhan times. After Geumgwan Gaya capitulated to Silla in 532, the Silla aristocracy accepted the royal house, bestowing the rank of "true bone," the second-highest level of the Silla bone rank system. General Kim Yu-shin of Silla descended from the last Gaya King. According to "Geographies" in Samguk Sagi, Daegaya existed for about 520 years from the first king, Ijinashi (이진아시왕), to the last, Doseolji (도설지왕). Daegaya had 16 kings from King Ininashi to King Doseolji, but only four have been recorded: 1st King Ijinashi, 9th King Anoi, 16th King Doseolji and King Haji with uncertain generation. King Haji (하지, 荷知) of Daegaya sent an embassy to Namje (南齊, the Southern Qi Dynasty) in 479. According to Chinese records, he received a rank of the third order, one rank below Baekje and Silla. Daegaya developed quickly and played a major role in the Gaya confederacy during the fifth century, partly because of their advanced steel-making craft, but neighboring Baekje and Silla kingdoms limited their progress. Incidental historical records and archaeological findings indicate a highly stratified aristocratic society at that time. King Haji allied with Baekje and Silla to attack Goguryeo in 481. Daegaya allied with Baekje in attacking Silla at the battle of Gwan Mountain Fortress in 554, but both Baekje and Gaya suffered heavy losses. That confrontation policy alienated the other member states, and Daegaya lost its leadership of Gaya to Ara Gaya. Daegaya fell to the Silla army under general Lee Sabu in 562 C.E..
Tomb attributed to King Taejo of Goryeong Gaya in Hamchang-eup. Little information exists on Seongsan Gaya, which existed around Seongju of Gyeongsangbuk-do. Seongsan linked in a close exchange with the other city-states of the confederacy. Seongsan has garnered fame for the numerous tumuluses (burial mounds) on Seongsan (Seong mountain) which stands 389.2m. A mountain fortress wall runs along the top of the mountain, approximately seventy tombs found near by. Along with the tombs, 129 artifacts have been excavated, all are at various stages of restoration. The tumuluses have a rectangular shaped chamber for the body and sub chambers for accessories. Evidence of live burial has been unearthed. The archaeological evidence indicates that Seongsan and Silla maintained a close relationship, severing a relationship with nearby Daegaya, which had hostile relations with Silla. Goryeong Gaya, was one of the lesser chiefdoms of the Gaya confederacy during the Korean Three Kingdoms period, centered in present-day Sangju City, North Gyeongsang province, South Korea. Legend states that King Taejo founded Goryeong Gaya. Goryeong Gaya established an alliance through marriage with Silla in 522. For that reason, Goryeong Gaya stayed on the sidelines during the Baekje-Daegaya offensive against Silla in 538. The alliance served little benefit to the kingdom of Goryeong Gaya. According to both the Samguk Sagi and the Japanese chronicle Nihonshoki, Goryeong Gaya fell to Silla in 562. That same year, Silla overran Daegaya in the south. The members of today's Hamchang Kim lineage trace their origins to the kings of Goryeong Gaya. Ara Gaya, also known as Ana Gaya, Asiryangguk (아시량국, 阿尸良國)), and Alla (안라, 安羅), existed as a city-state kingdom in the Gaya confederacy, in modern day Haman County of South Korea. As the confrontational foreign policy of Daegaya failed, Ara Gaya and its less confrontational policy gained support in the 540s. By the sixth century, Gaya could ill afford to risk the hostility of either Baekje or Silla (two of the Three Kingdoms of Korea that dominated the peninsula, the third being Goguryeo). Ara Gaya put a great deal of effort into pursuing a diplomatic solution for maintaining its independence, including hosting summits between Baekje, Silla, and Japan. The Gaya confederacy greatly weakened at the time as northwestern Gaya states fell to Baekje influence and southeastern states fell to Silla influence. Ara Gaya sought its independence by allying with Goguryeo, and asked Goguryeo to invade Baekje in 548. That attempt to weaken Baekje's sphere of influence failed when Goguryeo failed in the campaign. In the 550s, Silla defeated Baekje in a war and occupied the Gyeonggi area. Silla also invaded Gaya to eliminate Baekje's sphere of influence in Gaya. Ara Gaya capitulated to Silla in 559 C.E. Largest of the royal tumuli of Bihwa Gaya. A Gaya crown at the National Museum of Korea. Tomb of King Suro's queen: Heo Hwang-ok. Replica of a fifth century Gaya armor and helmet. Cheol, Shin Kyung. 2000. Appendix III: Relations Between Kaya and Wa in the Third to Fourth Centuries C.E. Journal of East Asian Archaeology. 2(3/4): 112-121. Pusan National University Museum: Gaya.